Fairies are the most commonly known Elementals probably because Fairies are everywhere. They are the guardians of plants and flowers. Every plant has a Fairy on it or even more than one. You will particularly be able to feel Fairy energy around flowers. Fairies also stay with cut flowers after they have been picked so if you have bunches of flowers in your house, Fairies will be nearby. The Fairies were the first Elementals that introduced themselves to me. At the start I could not see or hear Fairies but I could feel their excitable energy. After a couple of months of working on connecting into the Fairy realm I started to hear them and to see them on occasion. Fairies have squeaky little voices and are very playful but also sometimes a bit mischievous. They look like little people with slender bodies, big eyes (usually blue) and pointy ears. The flower Fairies wear hats usually which are the flower they are guarding and living on. They all wear different colours depending on their plant type and they have beautiful little wings protruding from their back. The Fairies are a very friendly group of Elementals who love to be spoken to and asked to help. Fairies are very powerful manifestors and know that through the processes of firm belief and clear visualisation they can attract what they want into their lives. The Fairies on earth are ready now to work with humans with a pure heart to teach us about their powerful manifestation skills and using the moon cycles to harness the available energy here on earth. Fairies are also keen to help us heal our hearts and to find love in everything and every situation. They have explained to me how it pains them to watch humans behaviour towards one and other and the animals and nature. Fairies live in big collective groups, or families as we call it, and they like to socialise, party and have fun together. They always see the love in every situation however they do get angry when we trash their homes and show no respect for planet earth and this is why they have a mischievous reputation. To connect into the Fairy realm all you need to do is to sit amongst flowers and plants. Quieten your mind and close your eyes. Perhaps hold a piece of rose quartz or amethyst crystal as the Fairies are very attracted to them or anything sparkly. Fairies connect with us through our clairsentience which is our sixth sense that allows us to receive messages through feelings. So open your heart to the Fairies. Allow them to come to you. Fairies can truly see who we are so if you have any problems or tendencies you know are not serving you well, hand them all over to the Fairies to heal. They will transmute any pain or egoic beliefs up to the light and help us to see a better way of being. Imagine yourself surrounded in a ball of white light. You may see sparkles and flashes as the Fairies throw their healing dust upon you. Imagine that you see two root protruding from your feet burrowing down deep into the earth. These roots reach right down into the centre of the earth connecting and grounding you. Now speak to the Fairies, ask them anything and notice any thoughts, feelings or visions that you get as the Fairies give you loving guidance and messages. 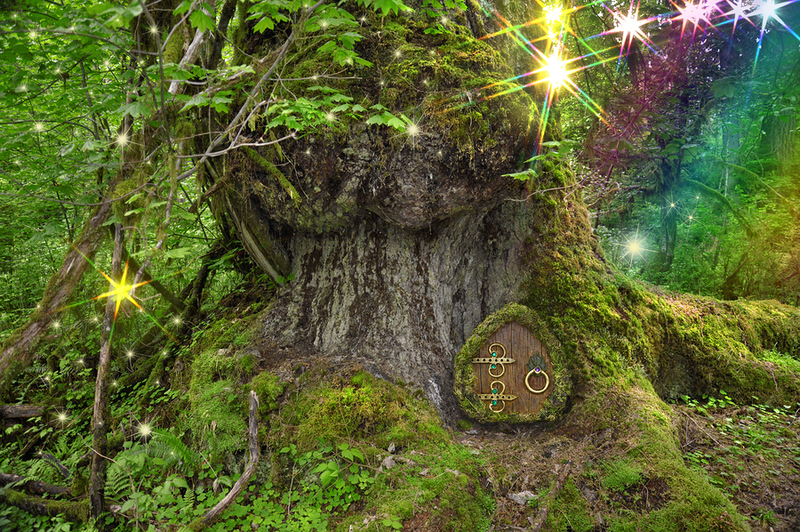 Once you connect with the Fairies they will enlist your help by encouraging you to pick up litter, participate in environmental projects, create a nature garden perhaps and encourage you to eat organically when possible. The Fairies are passionate environmentalists. Inviting the Fairies into your life is great fun as they will always be leaving you gifts and positive signs, helping you to meet the right people and to have new opportunities in your life. Fairies and Elementals prefer wild, natural environments therefore you will find more of them in these locations that are not so populated by man. As their energy is more powerful in these locations they are easier to feel and connect with. Fairies are also more active at the solstices and equinox. Fairies will help you with gardening guiding you to the right plants to buy and where to place them in your garden for example. They will assist with flower arranging and making your home beautiful. Ask them for help with any pest and disease problems and they will guide you to do what is best for the plants. Be aware that sometimes they may guide you to do things are not conventional but every time I have followed their guidance, for example to put a certain crystal in their pot, the plant has always healed. If you want more fun in your life ask the Fairies to help you arrange that. Most of all enjoy working with the Fairies and seeing where your journey takes you. I would love to hear any of your Fairy stories please email me at [email protected] or submit the form on my events page and I will start to put some up on the website. More information on working with Fairies is in my book Messages from Nature’s Guardians. Alphedia holds to lots of Fairy workshops and give Fairy talks. She also records Fairy meditations and is working on her next book How to Communicate with Fairies.